Senior PLO leader boasts that Palestinian Authority effectively blocked President Trump's 'Deal of the Century'. 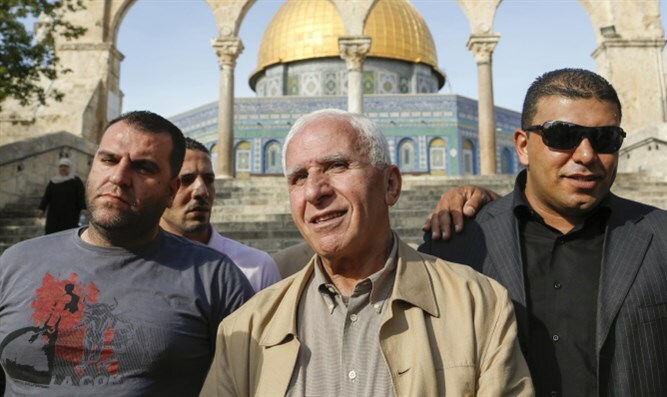 Azzam al-Ahmad, a senior member of the Palestine Liberation Organization and a Palestinian Authority legislator claimed recently that the PA had successfully blocked a long-awaited Middle East peace deal floated by President Donald Trump’s administration. The peace plan, dubbed by Trump the “Deal of the century”, was never publicly released, though envoys Jared Kushner and Jason Greenblatt discussed the key issues in the deal with both Israeli and Palestinian Authority officials during a series of visits to the region since Trump took office in January 2017. The PLO is set to hold a meeting next Monday in Ramallah to discuss the recent political developments in the region, including the PA’s responses to the Trump administration’s moves in the Middle East. The meeting will be hosted by PA chief Mahmoud Abbas. The meeting is the latest by a special committee empowered by the PA to draw up responses to the Trump administration’s recognition of Jerusalem as Israel’s capital, and the transfer of the US embassy from Tel Aviv to Jerusalem. Last month, the committee voted to freeze the PLO’s recognition of Israel until a Palestinian state is established along the June 4th, 1967 borders. According to reports in the PA’s WAFA mouthpiece, Al-Ahmad recently discussed plans by the committee next week to address the Trump administration’s Mideast peace plan, and efforts to reach a “humanitarian solution” for the Gaza Strip. Al-Ahmad claimed the effort to improve the living conditions of Gazans outside of the context of a final status agreement was an attempt to negate the PA’s demands for statehood. “A humanitarian solution for the Gaza Strip [would come] at the cost of [nullifying] legitimate international decisions and the two-state solution,” said al-Ahmad. The PLO leader added that the PA had succeeded in neutralizing Trump’s “Deal of the Century”, rendering it effectively irrelevant. Since PA objections torpedoed the achievement of a comprehensive deal under the aegis of the Trump administration, al-Ahmad continued, the White House had shifted its approach, looking for a piecemeal solution to the Middle East crisis, including “humanitarian solutions” for the Gaza Strip.